Named for the historic bay where Lewis and Clark wintered on the Pacific, the Astoria Bay™ large pellet insert is the ultimate culmination of design and function. Easy to start, easy to operate and easy to maintain. 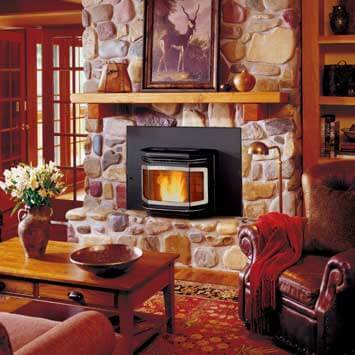 The Astoria Bay is designed to turn your inefficient open fireplace into a power house home heater (45,100 BTU/Hour). Adjust the feed rate to low and with the maximum fuel load (82 lbs. ), you can expect up to 52 hours of continuous heating. Use the provided wall thermostat and stretch the burn time even longer. The computerized control panel allows you to operate the Astoria Bay manually or change to a fully automatic mode with the push of a button. The EPA certified Astoria Bay is extremely clean to burn producing just 0.7 grams of emission per hour. Easy to understand controls and tool-free cleaning makes the Astoria Bay the easiest pellet insert to operate and maintain, and is backed by Avalon’s Seven Year Warranty.